Across all of the face shapes, people with diamond shaped faces are the most rare. There's no need to worry, though! Finding the perfect pair is still simply as can be. For people with diamond shaped faces, a pair of frames that sweep up towards the eyes in will fit perfectly. Cat eyes are one example of a great option, but anything that ticks upward will work draw attention to your key features and work wonders. Color-wise, a pair of glasses that is darker or heavier on the top (such as half rimmed glasses) are a fantastic choice for sunglasses. They give more structure to the top of the face and distract from the bottom where the jawline is elongated. Not sure if you have a diamond shaped face? Snap a selfie or take a look in the mirror and trace the outline of your face. A diamond face is best known for its narrow forehead, planed cheekbones and pointed chin. With your facial shape, you will want to go with sunglasses that properly accentuate some features while minimizing others. We recommend top-heavy browline frames for diamond shaped faces. 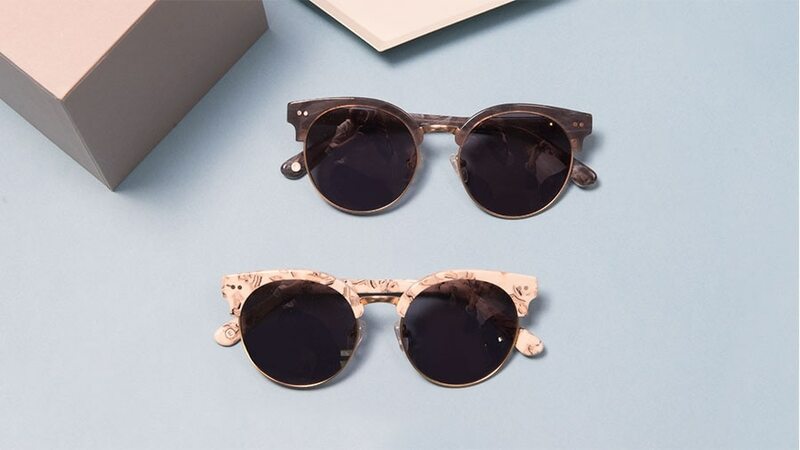 Not only are they impeccably classy, they also create excellent contrast with your cheekbones. Classic, sleek, and undeniably refined. Oval sunglasses can add a subtle but effective touch of contrast to your already proportioned features. People with diamond faces often have gorgeous and well-defined cheekbones. A pair of upswept cat-eye sunglasses will really draw attention to your face's most attractive features. Sunglasses with square lenses will make your eyes appear more narrow. However, frames with rectangle lenses can add more contour to your cheeks and draw more attention to the upper half of your face. Contrast is key when you're searching for sunglasses for diamond shaped faces. Keep in mind that your lens size shouldn't to be too large. At the same time, you should also avoid anything too small or narrow. Either of these will give the eyes a squinty or bunched look. Go for medium to larger sized lenses and frames that support them. Rounded or oval lenses will work well with the cheekbones, where square lenses may work against you in the forehead department, and make your eye line appear narrower than it actually is. When it comes to sunglasses options, people with diamond shaped faces are in luck. The amount of choice they have lets them explore all kinds of categories when shopping for glasses online. With our EyeTry feature, you can virtually try on any pair you find on our website. You can start by checking out our selection of trendy glasses for round faces. Then, hit the "Try On" button to get started. All you need to do next is upload a photo of yourself to see how you might look in the glasses you chose. It's that simple.